Opened in 1979, The Hot Bagel Bakery is owned and operated by brothers Dan and John Grimes. Our bakery is supervised by the Jersey Shore Orthodox Rabbinate. Our daily goal is to produce the best tasting bagels you'll ever eat. We always use the finest ingredients available. To form our dough we use an old fashioned barrel mixer to create the perfect bagel crunch. We hand roll every bagel to create our signature texture and taste. Finally, our bagels are boiled and then baked in a revolving oven. 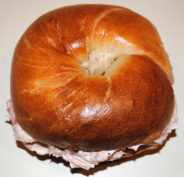 The Hot Bagel Bakery takes pride in every bagel we sell. On behalf of The Hot Bagel Bakery, we want to thank you for your support and your business for the last 30 years. Read more about us on the Asbury Park Press website.